Clickthrough rate influences organic rankings Click To TweetThere has been a debate among SEO pros over the past year or two about the importance of clickthrough rate (CTR) as a factor in organic rankings. In this SEO case study, you will see the results for two auto parts clients and the positive impact organic CTR has on keyword rankings. We’ve had tremendous success boosting organic rankings and total organic visits for clients, and posted an article about it last year. We wanted to share more test results nearly a year later. 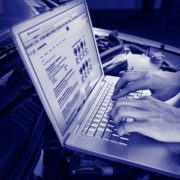 We focus exclusively on the automotive aftermarket at Hedges & Company, and we’re continuously fine-tuning our SEO technique for marketing auto parts and truck parts online. We started optimizing a client website to improve clickthrough rate in April 2016. Before optimizing for CTR, we pulled ranking and CTR data from Google Search Console to create a baseline. We pulled more organic data several times through 2016, and finally in January 2017. We looked at all non-brand keywords that were generating the most organic traffic. We split those keywords into two groups: the top 100 keywords where we optimized to increase CTR, and the top 100 keywords where the CTR was not optimized. The keywords that were not optimized either had no change in CTR or CTR dropped. The top 100 keywords where we optimized for CTR started at an average organic ranking position of 4.5. Within a few months of optimizing, the average position improved to 3.5 (first chart). 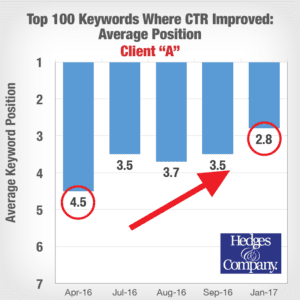 These keywords continued to improve their organic ranking through 2016 and in January had an average organic ranking of 2.8! That’s an improvement of nearly two positions directly related to to the improvement in clickthrough rate. On the flip side, we looked at keywords that we didn’t optimize for CTR. 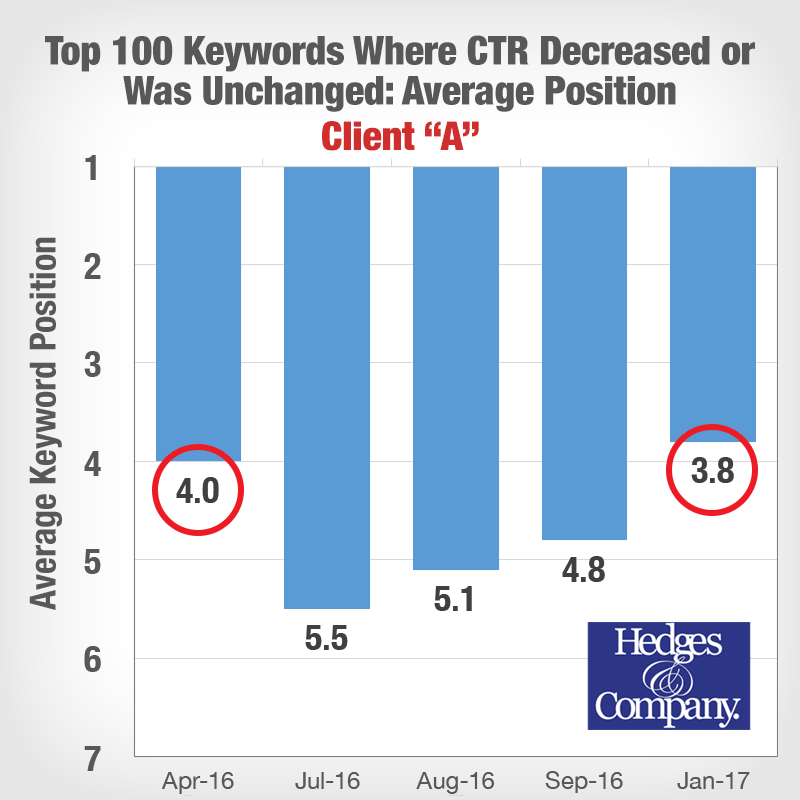 The 100 keywords where the CTR stayed the same or dropped from April 2016 had an average starting position of 4.0 – actually a little better than the first group. Rankings for these keywords dropped over the next several months (second chart, right), but in January, although these keywords improved they had nearly the same ranking (3.8) as they did last April. Keywords where CTR improved steadily rose in their organic rankings Click To TweetWe also looked at the next group of 100 keywords and discovered the exact same patterns. Just to be sure we looked at the next group of 100 keywords after that. 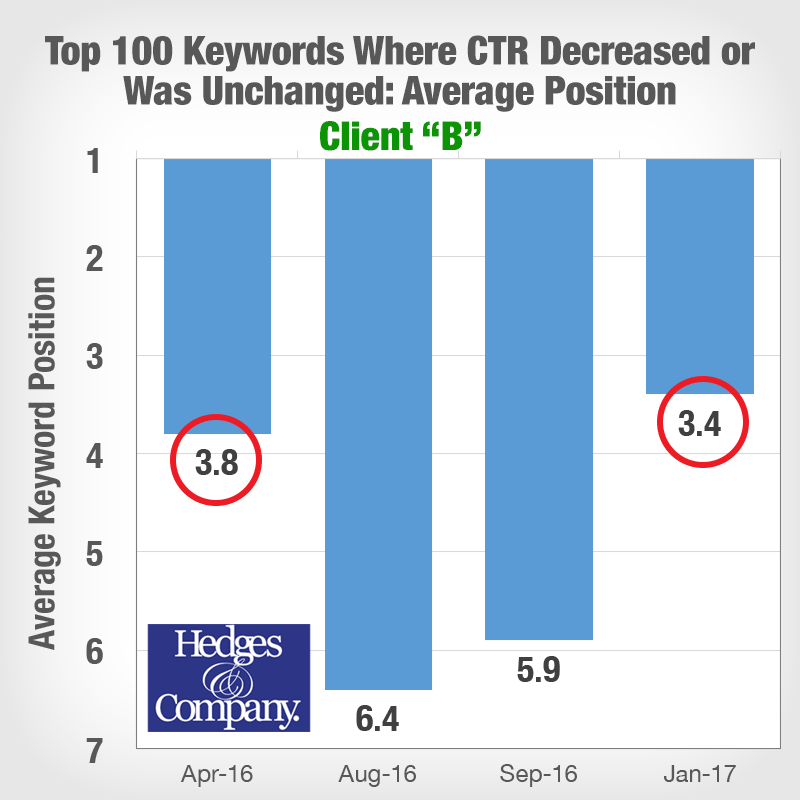 Keywords where CTR improved steadily rose in their organic rankings. Of course, an additional benefit to improving CTR for SEO is getting more organic traffic from existing organic impressions. 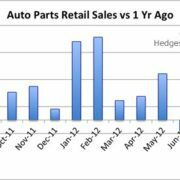 Nearly a year later, in the off-season for auto parts, this client’s organic traffic is up over 30% from the 2016 peak buying season! That’s a substantial improvement. Another client had similar amazing results. As with Client “A” we pulled data from Google Search Console to create a baseline. We pulled more data two times in 2016, and in January 2017. Again, we looked at all non-brand keywords that were generating the most organic traffic and split them into keywords where CTR was optimized and improved, and keywords where CTR was not optimized and stayed the same or decreased. The top 100 keywords where CTR improved started at an average organic ranking position of 4.7 (chart at left). Four months later the average organic position improved to 3.6, then 3.0, and in January 2017 had an average position of 2.2, an improvement of 2.5 positions! 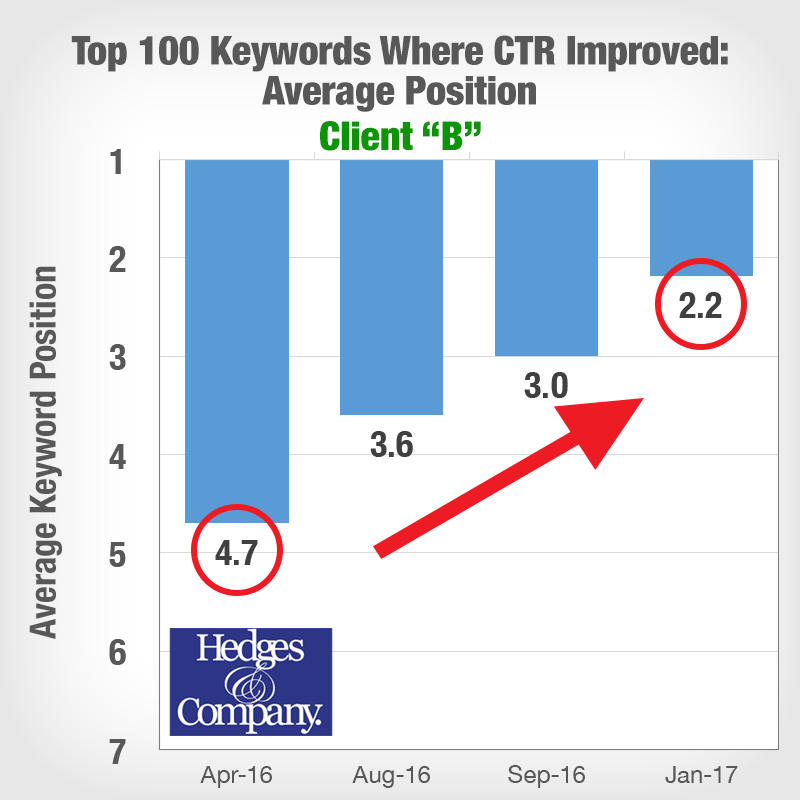 The top 100 keywords where the CTR stayed the same or dropped started at an average ranking of 3.8– a better average than the first group of keywords. Nine months later, their average position barely changed, at 3.4. This client is seeing an overall increase in organic traffic, too. January 2017 organic traffic has nearly doubled – up 99% – from peak buying season in 2016! That’s another remarkable improvement after focusing on CTR (as well as many other things for SEO, too, including extensive content development for the website and technical optimizations). Why is clickthrough rate important for organic rankings? Simple. 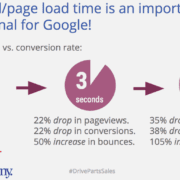 It’s a measure of user engagement, just like time spent on a site or bounce rate. 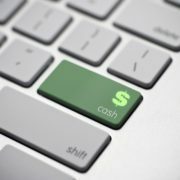 Our online marketing manager Chris likens it to using Quality Score (QS) in paid search: In paid search ads, QS takes into account expected clickthrough rate, among other things, as well as landing page experience and ad relevance. 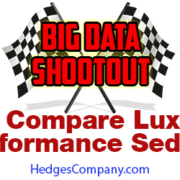 Why wouldn’t Google or Bing have a QS equivalent for organic search? RankBrain is Google’s machine-learning artificial intelligence algorithm for organic search. RankBrain analyzes click through rate (CTR) for search results, and is always looking for the most relevant pages to show for specific keywords. Although that’s a very simplistic explanation of RankBrain, we do know it is an increasingly important factor in determining organic rankings, and is becoming more important all the time. Think of RankBrain as measuring Quality Score for your organic search results. 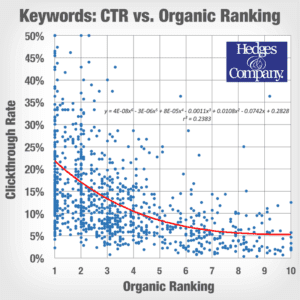 At left is a scatter chart showing clickthrough rate vs. organic ranking, for one account. Each blue dot is a keyword or phrase that brings traffic to the site. The data is pulled from Google Search Console. The overall CTR vs. ranking trendline is shown in red. When we optimize a client’s website for SEO we pay close attention to under-performing keywords. In this chart, under-performing keywords are below the red line. This is one way we take a scientific, analytical approach to SEO. If you need help getting more traffic to your website, let’s have a conversation, just click the bottom below to contact us!